This article is about the animal. For the computer input device, see Computer mouse. For other uses, see Mouse (disambiguation). "Mice" redirects here. For other uses, see Mice (disambiguation). Species of mice are mostly found in Rodentia, and are present throughout the order. Typical mice are found in the genus Mus. Mice are typically distinguished from rats by their size. Generally, when someone discovers a smaller muroid rodent, its common name includes the term mouse, while if it is larger, the name includes the term rat. Common terms rat and mouse are not taxonomically specific. Scientifically, the term mouse is not confined to members of Mus for example, but includes such as the deer mouse, Peromyscus. Domestic mice sold as pets often differ substantially in size from the common house mouse. This is attributable both to breeding and to different conditions in the wild. The best-known strain, the white lab mouse, has more uniform traits that are appropriate to its use in research. Mice, in certain contexts, can be considered vermin which are a major source of crop damage, causing structural damage and spreading diseases through their parasites and feces. In North America, breathing dust that has come in contact with mouse excrement has been linked to hantavirus, which may lead to hantavirus pulmonary syndrome (HPS). Mice build long intricate burrows in the wild. These typically have long entrances and are equipped with escape tunnels or routes. In at least one species, the architectural design of a burrow is a genetic trait. Mice are common experimental animals in laboratory research of biology and psychology fields primarily because they are mammals, and also because they share a high degree of homology with humans. They are the most commonly used mammalian model organism, more common than rats. The mouse genome has been sequenced, and virtually all mouse genes have human homologs. The mouse has approximately 2.7 billion base pairs and 20 pairs of chromosomes. They can also be manipulated in ways that are illegal with humans, although animal rights activists often object. A knockout mouse is a genetically modified mouse that has had one or more of its genes made inoperable through a gene knockout. Reasons for common selection of mice are small size, inexpensive, widely varied diet, easily maintained, and can reproduce quickly. Several generations of mice can be observed in a relatively short time. Mice are generally very docile if raised from birth and given sufficient human contact. However, certain strains have been known to be quite temperamental. Mice and rats have the same organs in the same places, with the difference of size. Cage – Usually a hamster or gerbil cage, but a variety of special mouse cages are now available. Most should have a secure door. Bedding – Usually made of hardwood pulp, such as aspen, sometimes from shredded, uninked paper or recycled virgin wood pulp. Using corn husk bedding is avoided because it promotes Aspergillus fungus, and can grow mold once it gets wet, which is rough on their feet. In nature, mice are largely herbivores, consuming any kind of fruit or grain from plants. However, mice adapt well to urban areas and are known for eating almost all types of food scraps. In captivity, mice are commonly fed commercial pelleted mouse diet. These diets are nutritionally complete, but they still need a large variety of vegetables. Mice are a staple in the diet of many small carnivores. Humans have eaten mice since prehistoric times and still eat them as a delicacy throughout eastern Zambia and northern Malawi, where they are a seasonal source of protein. Mice are no longer routinely consumed by humans elsewhere. However, in Victorian Britain, fried mice were still given to children as a folk remedy for bed-wetting; while Jared Diamond reports creamed mice being used in England as a dietary supplement during W. W. II rationing. Prescribed cures in Ancient Egypt included mice as medicine. In Ancient Egypt, when infants were ill, mice were eaten as treatment by their mothers. It was believed that mouse eating by the mother would help heal the baby who was ill. In various countries mice are used as food for pets such as snakes, lizards, frogs, tarantulas and birds of prey, and many pet stores carry mice for this purpose. 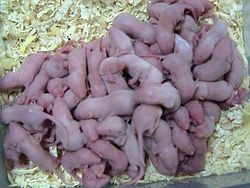 Common terms used to refer to different ages/sizes of mice when sold for pet food are "pinkies", "fuzzies", "crawlers", "hoppers", and "adults". Pinkies are newborn mice that have not yet grown fur; fuzzies have some fur but are not very mobile; hoppers have a full coat of hair and are fully mobile but are smaller than adult mice. Mice without fur are easier for the animal to consume; however, mice with fur may be more convincing as animal feed. These terms are also used to refer to the various growth stages of rats (see Fancy rat). ^ Behney, W. H. (1 January 1936). "Nocturnal Explorations of the Forest Deer-Mouse". Journal of Mammalogy. 17 (3): 225–230. doi:10.2307/1374418. JSTOR 1374418. ^ "Mice : The Humane Society of the United States". Retrieved 15 August 2016. ^ Weber, Jesse N.; Peterson, Brant K.; Hoekstra, Hopi E. (17 January 2013). "Discrete genetic modules are responsible for complex burrow evolution in Peromyscus mice". Nature. 493 (7432): 402–405. Bibcode:2013Natur.493..402W. doi:10.1038/nature11816. PMID 23325221. ^ "2002 Release: Draft Sequence of Mouse Genome". Retrieved 15 August 2016. ^ Sharon L. Vanderlip (2001). Mice: Everything About History, Care, Nutrition, Handling, and Behavior. Barron's Educational Series. pp. 38–. ISBN 978-0-7641-1812-8. Retrieved 22 April 2013. ^ "Mouse Info". Retrieved 15 August 2016. ^ Tembo, Mwizenge S. "Mice as a Delicacy: the Significance of Mice in the Diet of the Tumbuka People of Eastern Zambia". Archived from the original on 23 June 2008. Retrieved 13 August 2008. ^ "BBC – History – Ancient History in depth: Health Hazards and Cures in Ancient Egypt". Retrieved 15 August 2016. ^ Hart, George (1 May 2001). What life was like. Time Life Books. p. 40. ISBN 978-0-7370-1007-7. ^ Encyc of Discovery Science and History. Fog City Press. 1 September 2002. p. 320. ISBN 978-1-876778-92-7. ^ "Tour Egypt :: Egypt: A Carefree Childhood in Ancient Egypt". Retrieved 15 August 2016. ^ Shuter, Jane (2003). The Egyptians. Raintree. p. 10. ISBN 978-0-7398-6440-1. ^ Fontanel, Béatrice; D'Harcourt, Claire (1997). Babies: history, art, and folklore. Harry N. Abrams. p. 64. ^ Colón, A. R.; Colón, P. A. (1999). Nurturing Children: A History of Pediatrics. Greenwood Press. p. 20. ISBN 978-0-313-31080-5. ^ Blum, Richard H.; Blum, Eva Marie (1970). The Dangerous Hour: The Lore of Crisis and Mystery in Rural Greece. Scribner. p. 336. ^ "South Florida's True Rodent Professionals". Retrieved 29 May 2009.